Sabres Acquire Taylor Leier from the Flyers for Justin Bailey · Let's Go Amerks! The Buffalo Sabres made an announcement late Thursday night that the team had acquired forward Taylor Leier from the Philadelphia Flyers in exchange for forward Justin Bailey. A trade that was a surprise but at the same time really wasn’t. 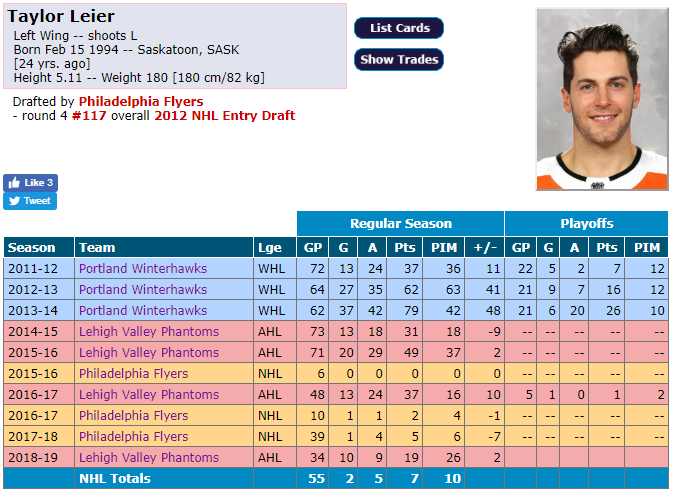 Leier was immediately assigned to the Rochester Americans once the trade was completed. On the surface the trade appears to be an even deal with similar types of players that could both use a change of scenery. Outside of any personal connections that people have with the players there isn’t anything to dislike about the trade. Leier has an upside with skating and scoring potential and a fresh start may help jump start the scoring potential. It’s an AHL trade that benefits the AHL teams. Leier has played in 34 of 39 games with the Lehigh Valley Phantoms this season with 19 points (10G+9A) along with 26 penalty minutes. He’s also coming off a two game stretch in which he’s score three goals and has seven points (3G+4A) in his last seven games. His 19 points will put him at 8th overall on the Amerks, the same spot that Bailey was in with 20 points. Both Leier and Bailey are similar this season in that they’ve both had three different two goal games. They’ve both had some extended stretches without goals. Leier is a year older than Bailey but is playing with the same chip on his shoulder that Bailey had to try and prove that he can still be an NHL player. Leier is currently signed to a one year one-way contract with the Philadelphia Flyers and will be a restricted free agent at the end of the season. The one-way contract means that Leier is getting paid $720,000 to play in the American League, a sign that the Sabres still aren’t concerned about money when it comes to players in Rochester. The last full season that Leier played in the American League was 2015/2016 when he finished with 49 points (20G+29A) in 71 games. He’s also played in 55 NHL games with the Flyers over the course of the previous three seasons. He spent the entire 2017/2018 season with the Flyers but only appeared in 39 games, a majority of which were all before December 31. He was named MVP of the 2017 AHL All-Star Game with three goals in the game. 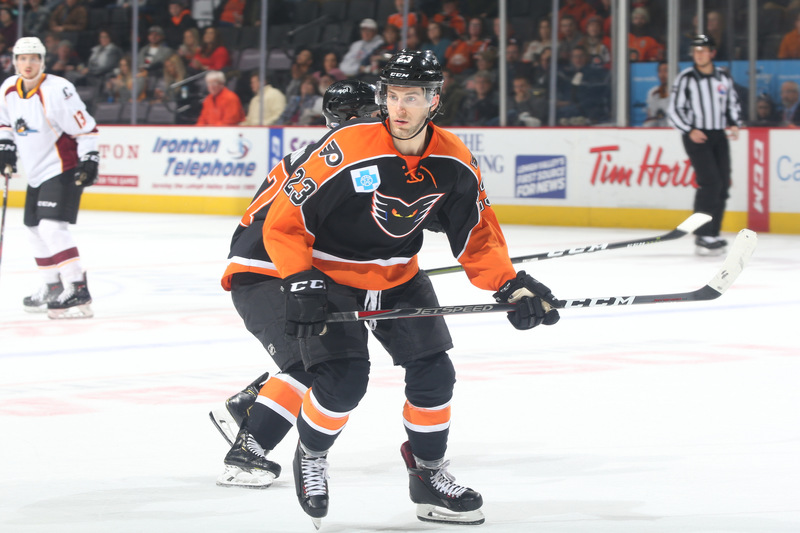 There’s always a connection of some sort between players on a new team and for Leier it’s the end of the 2015/2016 season when Dalton Smith also played on the Lehigh Valley Phantoms. With help from Brad Keffer – noted Phantoms’ advanced stats tracker (be sure to check out his website!) – a deeper look into the numbers reveals Leier has been arguably the team’s best forward in the last 10 games. Over the last 10 games, Leier has a 56.7% Corsi for (CF) and a 63.95% scoring chances for (SCF) at 5-on-5. Both of those figures are first on the team during that time frame. Then there’s relative stats, which is a way to view how the team played while a certain player was on the bench vs when they’re on the ice. In the last 10 games the Phantoms have a 45.9% CF and 45.02% SCF with Leier on the bench, making his relative stats as follows: +10.85% CF rel, and +18.94% SCF rel. Both, again, first on the team. For those wondering, Brad tracks those advanced stats by hand. Justin Bailey finishes his time in Rochester with 20 points (9G+11A) in 37 games this season. In 196 games as an Amerks forward he tallied 116 points (62G+54A). He scored 20 goals in his first season and 23 in his second with the Amerks while playing on teams that weren’t going to make the playoffs. Depending on who you ask you’ll get a different response about his legacy in Rochester. One thing that can never be taken away is the positive impact he had on a young fan base. Bailey never hesitated to sign an autograph, take a picture, or give a high five at the tunnel. Those are memories that create fans for life. The Amerks play tonight on the road against Wilkes-Barre/Scranton Penguins and travel to play on the road against Lehigh Valley on Saturday. It won’t take long for Leier and Bailey to play against their former teams.